Last month in July 21-23 the Henry Center sponsored a conference at the beautiful campus of Tokyo Christian University in Tokyo, Japan. The conference was led by Dr. Harold Netland (Naomi A. Fausch Chair of Missions at Trinity Evangelical Divinity School) and Dr. Takanori Kobayashi (NT professor and Dean of Faculty at Tokyo Christian University). 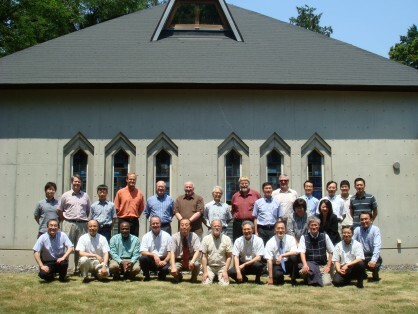 Conference participants included scholars from Asia (Anri Morimoto, Heon-Wook Park, Akio Ito, Shohei Yamato, Hisakazu Inagaki), the US (Douglas Sweeney, Richard Mouw, and Nelson Jennings), Europe (Richard Bauckham), Africa (Tite Tiénou), and Australia (Graham Cole). The participants heard excellent presentations, edifying devotional reflections, and everyone was sharpened and encouraged by productive conversations about Christology, global theology, and Christian witness in religiously pluralistic environments. In addition to the Spirit of the living Christ himself, the unseen guest at the conference was Kazoh Kitamori, whose ‘pain of God’ theology was so important to the work of the conference. As one of the participants mentioned, ‘if I had a hundred yen for every mention of his name last week, I could take you out for a very nice dinner.’ Theologians east and west struggled together, with Kitamori’s help, to balance the victorious and the suffering elements of a global Christology. In case anyone was in doubt, by the end of the conference it was clear to all that Japanese and East Asian theologians are crucial to the task of any legitimate global Christology. The conference was a wonderful example of how to globalize our theological discourse. Alas, the papers from the conference are not yet available to the wider public, but publication plans are currently underway.